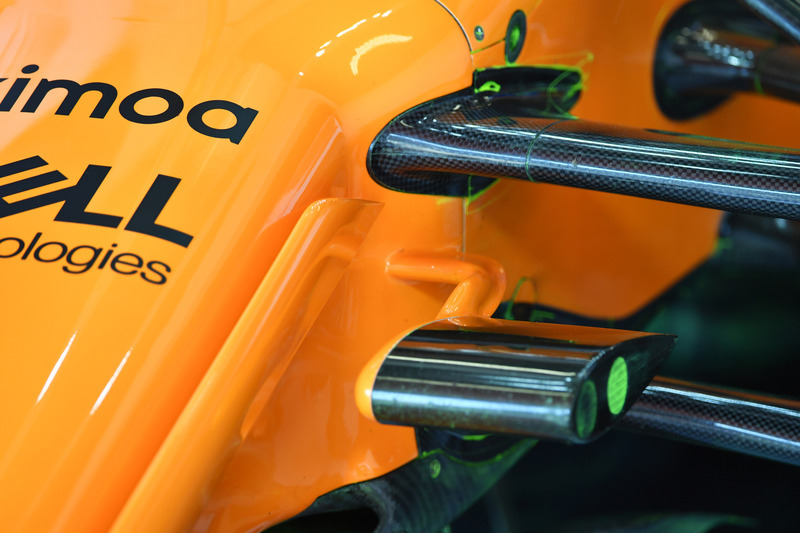 As the old saying goes, out of the frying pan and into the fire, and that’s exactly where McLaren found itself in 2018, as it separated from Honda and started its first year with customer Renault power. 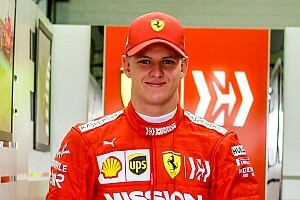 This deal came together extremely late in the car’s development cycle, so much so that it compromised the overall design decisions and weakened its challenge. 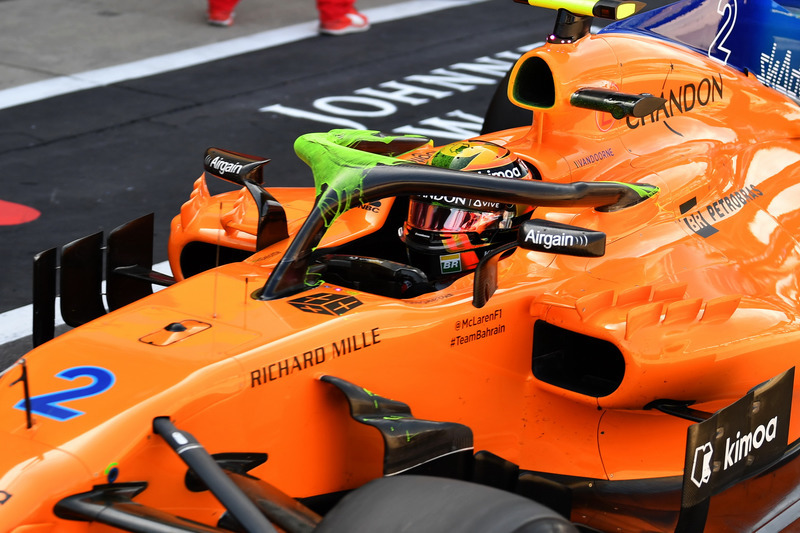 The MCL33 was an evolution of its predecessors, cars that the team had often ‘talked up’ as being one of the best on the grid, save for the lack of performance and reliability from the Honda power unit. 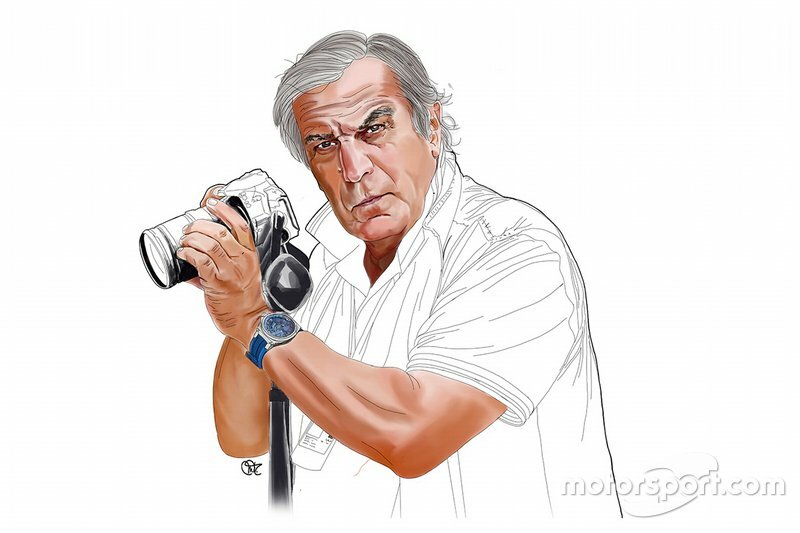 However, the truncated development phase, introduction of the halo – which was clearly a resource sapping enterprise of its own – and correlation issues with the windtunnel, left McLaren in no man’s land when it came to the championship. 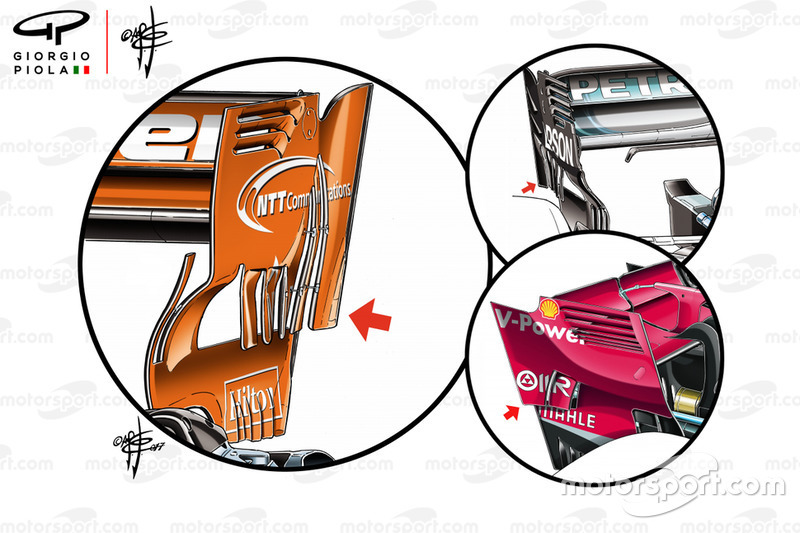 McLaren’s straked rear wing design, a concept first introduced by the team in 2017, was retained and latterly became the focus of other team’s desires (Mercedes and Ferrari’s iterations inset). 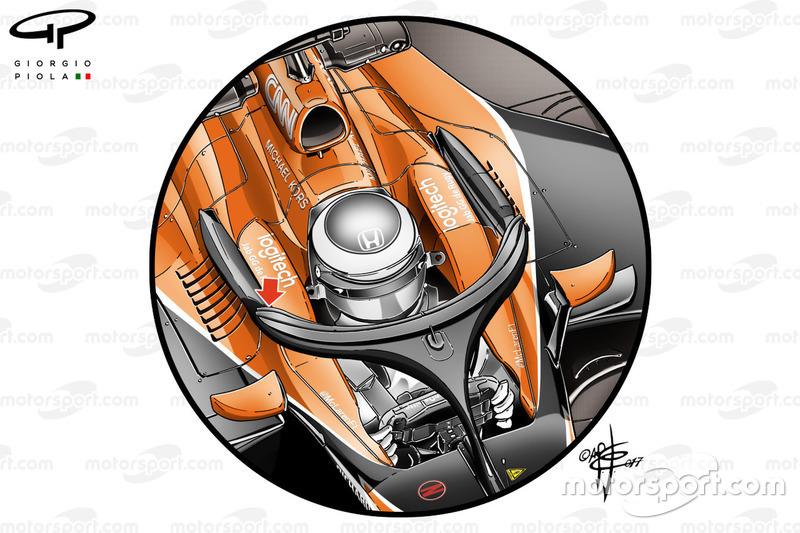 The halos that we saw various teams test throughout 2017 were simply a mock-up of the totally tied-in versions we saw this year, but at the post-season test in Abu Dhabi, McLaren offered us a sample of the aerodynamic appendages we’d likely see fixed to the safety structures this year. 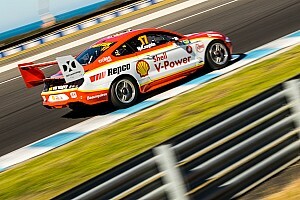 In fact, that triple element winglet used in the test was the same design used throughout the season. 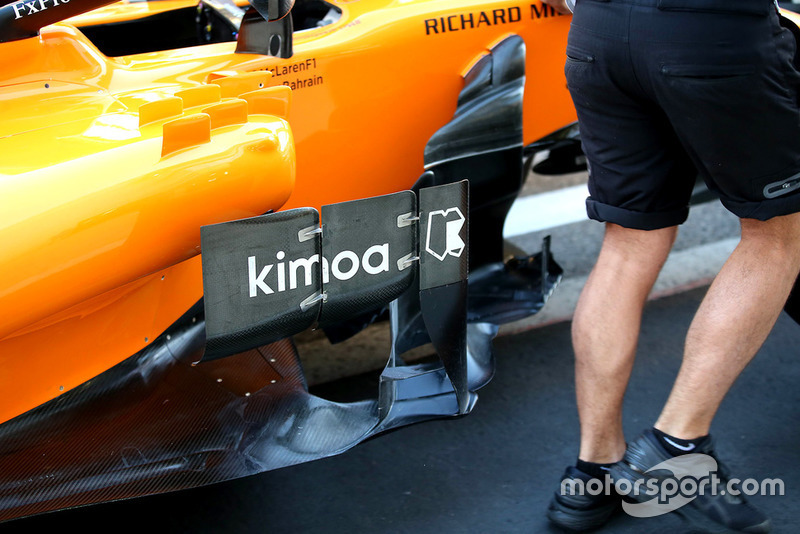 A close up of the triple-element winglet sat astride the halo, all elements of which wrap around the side of the structure to influence the airflow. 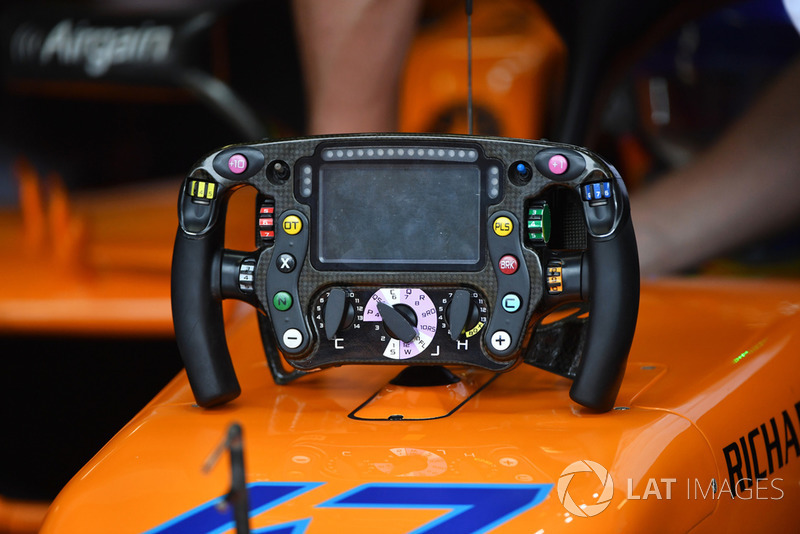 The 2018-specification steering wheel, with its various buttons and rotary switches that help the driver to monitor and control the power unit. 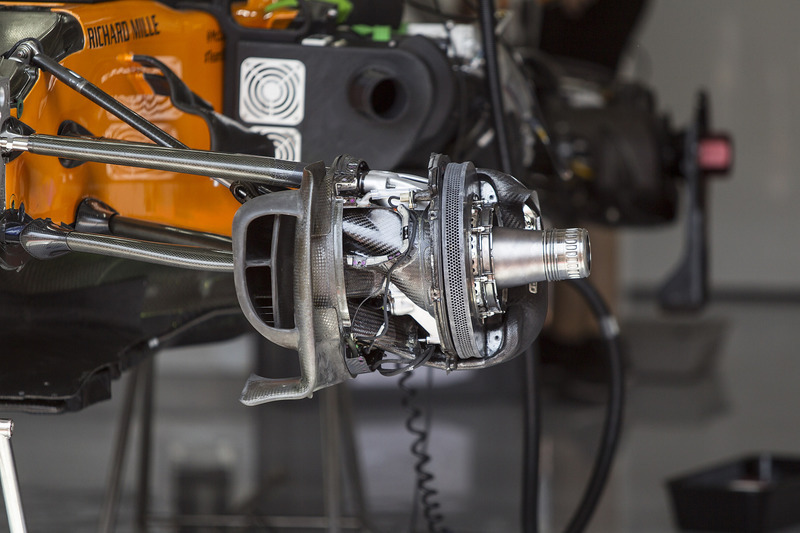 McLaren continued to use a blown axle in 2018, as seen here as part of the brake assembly at the French GP. 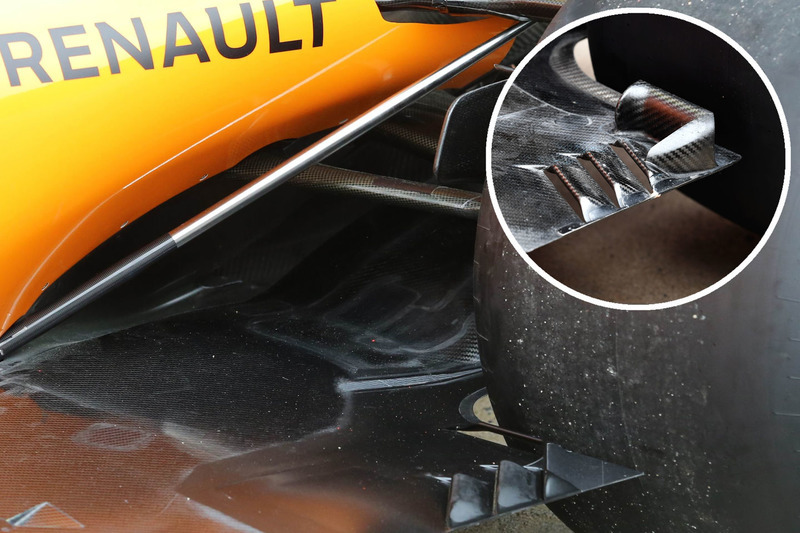 Airflow taken in by the large inlet is fed through the hollow axle and ejected out of the end of the stub axle to give an aerodynamic boost. 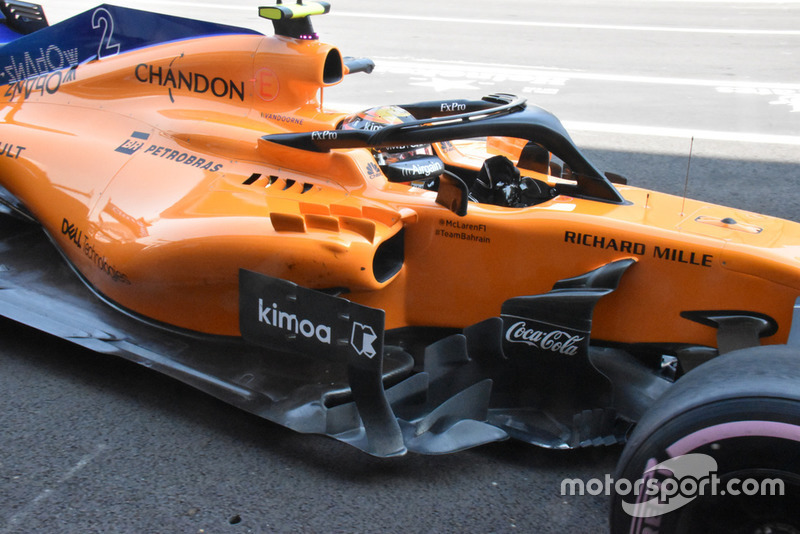 A close up of the six vortex generators lined up atop the MCL33’s sidepod, McLaren the only team still pressing on with this design, whereas most of the field now use a variation of upstands and slats in this area. An amazing shot of the level of detail that the designers go into when creating the winglets that are housed on the rear brake duct. 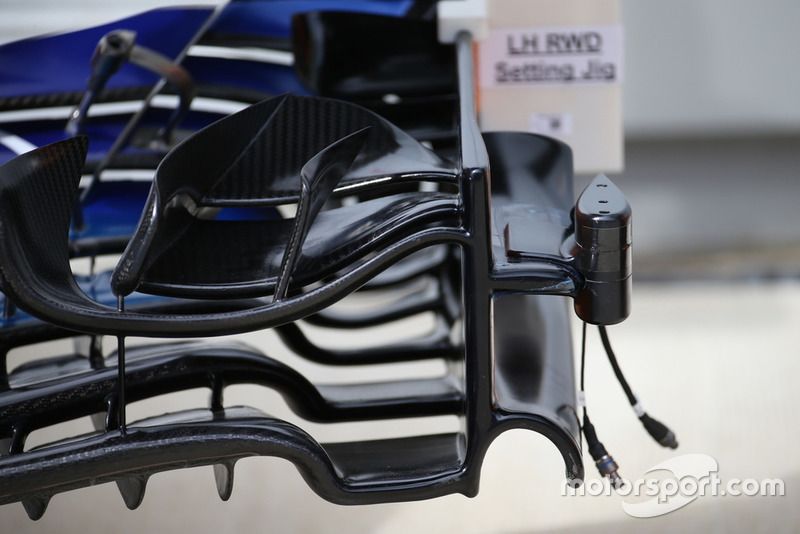 A shot of the bargeboard area when it was at its most simplistic, during pre-season testing. 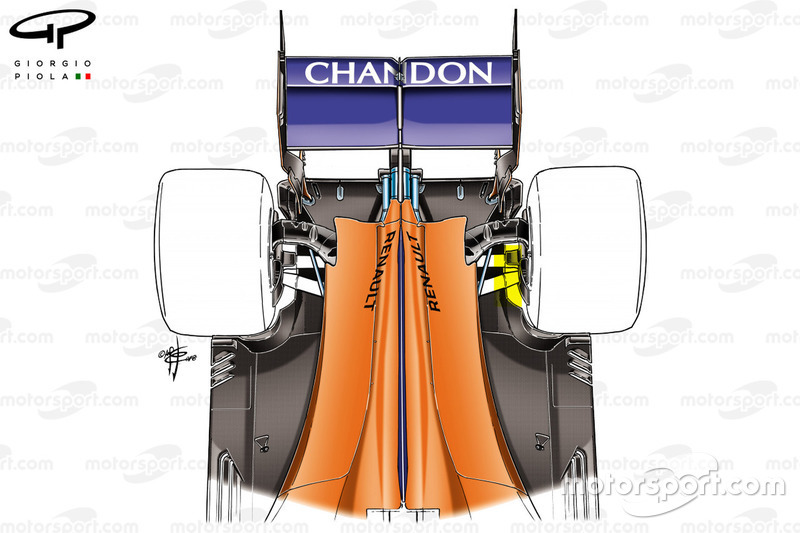 A top-down overview of the MCL33’s rear end, note the offset upper wishbone arrangement which cleans up the area in an attempt to improve airflow. 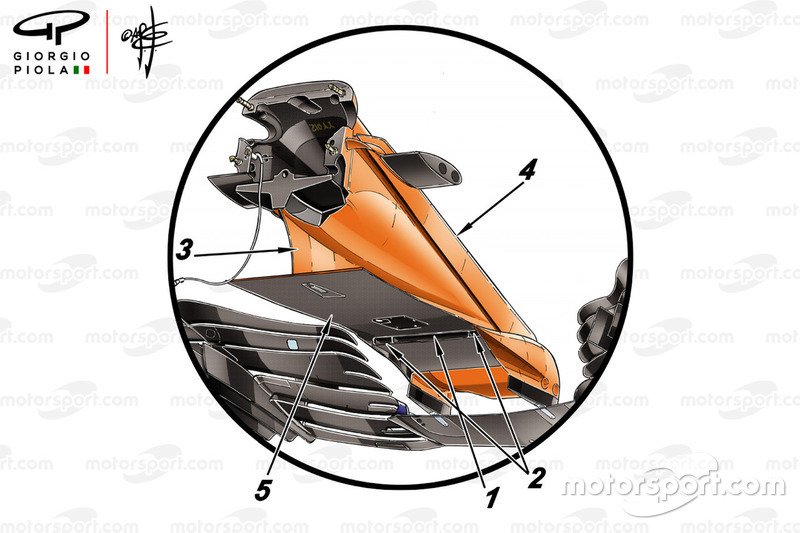 McLaren trialled this simple, single-element T-Wing at the Chinese GP. 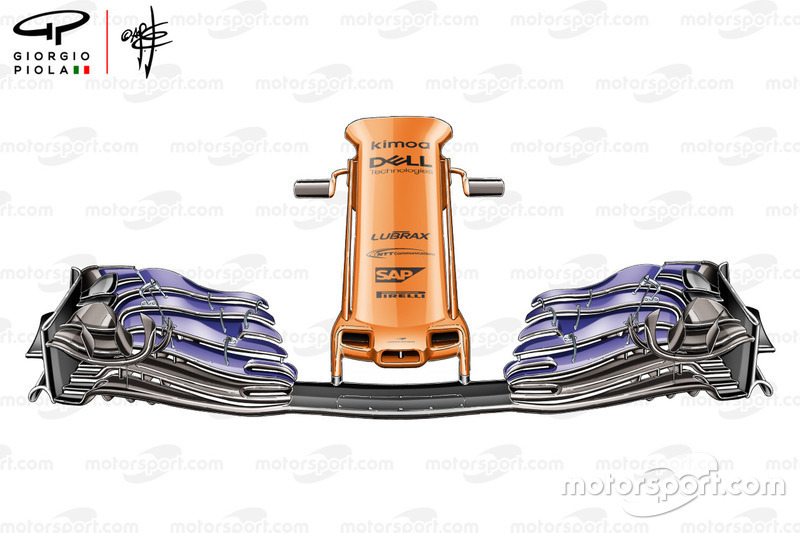 McLaren ditched its sidepod airflow conditioners in Bahrain for the more trendy and forward-reaching deflectors. 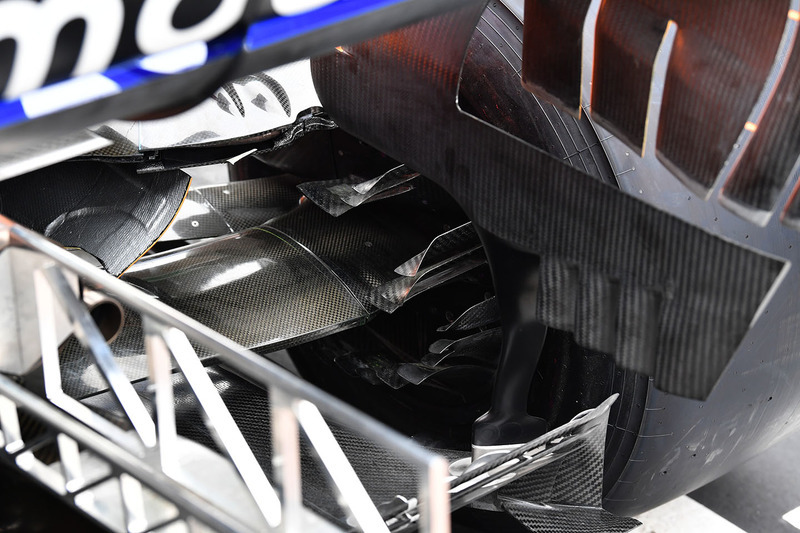 An overview of the bargeboard area at the Azerbaijan GP, note the spiked edge of the splitter, this was an area of the car that evolved several times throughout the season. 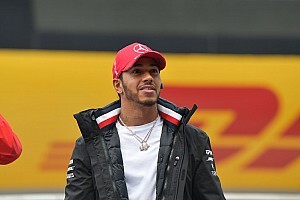 The team hoped a delivery of new parts at the Spanish GP would help to improve its chances during the rest of the season. 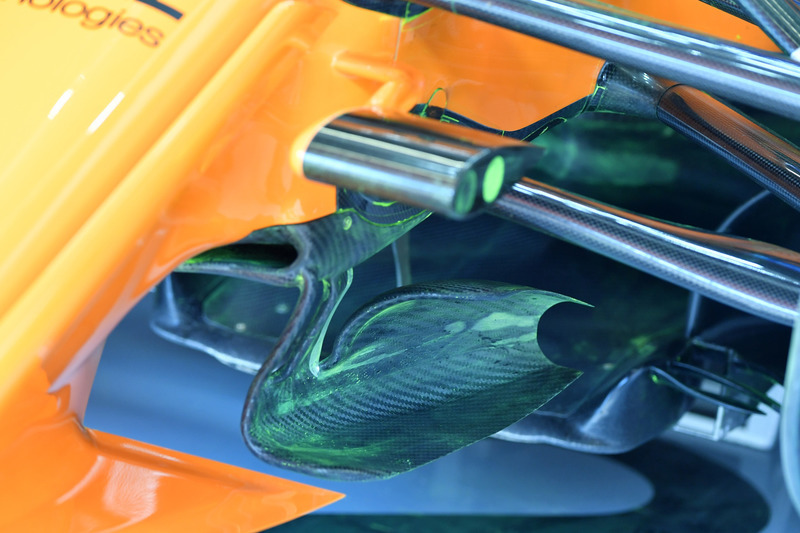 The centrepiece of this collection was the team’s new nosecone, which features numerous elements seen elsewhere up and down the grid along with some of their own design cues. 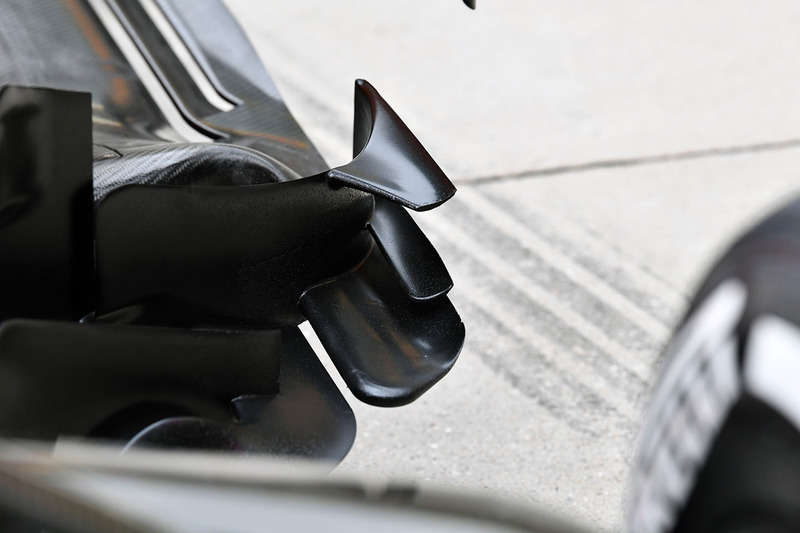 (1 & 2) Airflow collected by the inlets in the snout of the nose (see next slide) is ejected from these outlets, driving flow beneath the ‘cape’ (5) which we’ve already seen employed by Mercedes and Williams. The cape is draped low below the nose and so a central diverter (3) was used by the team to bridge that gap and help guide the flow between the surfaces. Meanwhile, flanking the nosecone are two panels that look to help align the flow around the structure. 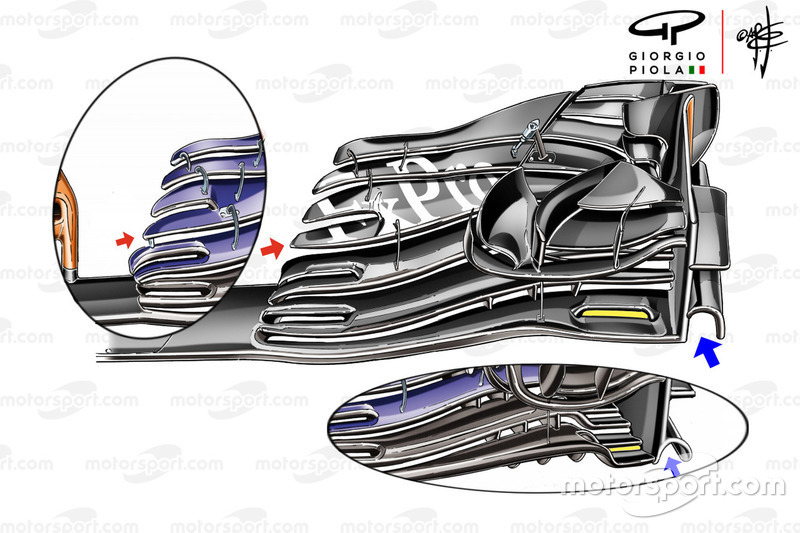 The forward view of the nose shows how the triple inlet arrangement in the snout drives airflow through to the cape, in what be considered a hybrid version of the designs used by both Red Bull and Sauber. A close up of the new stalks that carry the cameras. Gathering up the airflow from the new ‘cape’ solution and repurposing it was this tidy set of turning vanes. 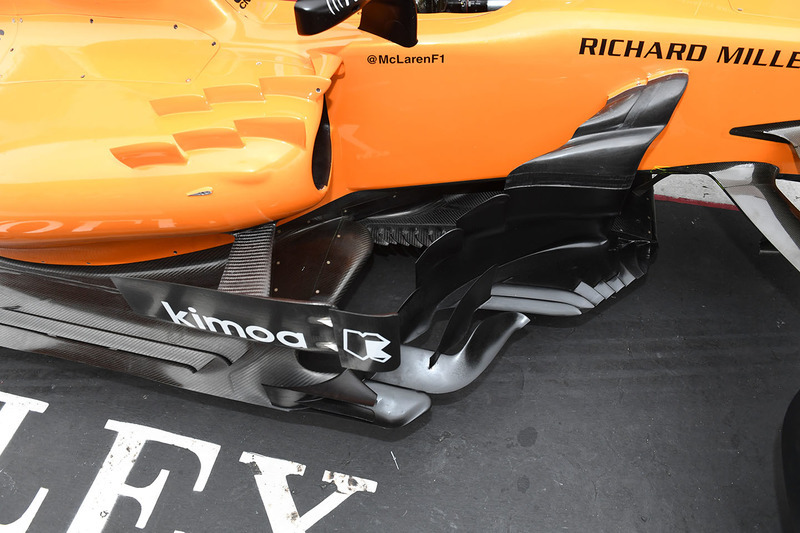 The team added this vertical flow diverter into their sidepod deflector mix too, as it looked to improve flow around the sidepod and protect it from the wake created by the front tyre. As part of the cache of parts that we uncovered in this update the floor ahead of the rear tyre was altered to better maximise the regulations, with a large fully-enclosed hole taking the place of the upstand previously located there (inset). 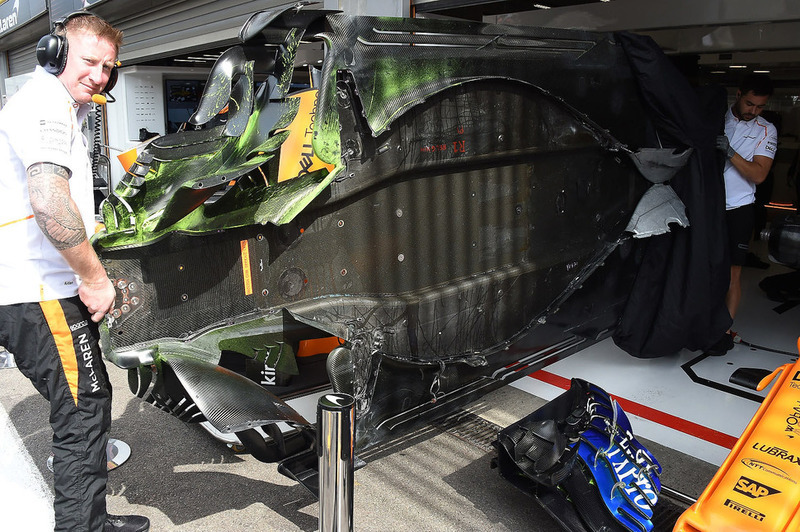 Meanwhile, at the rear of the car, the team made alterations to the diffusers central transition from the plank and the shape and number of the Gurney-style flaps that live above it and wrap around the crash structure. 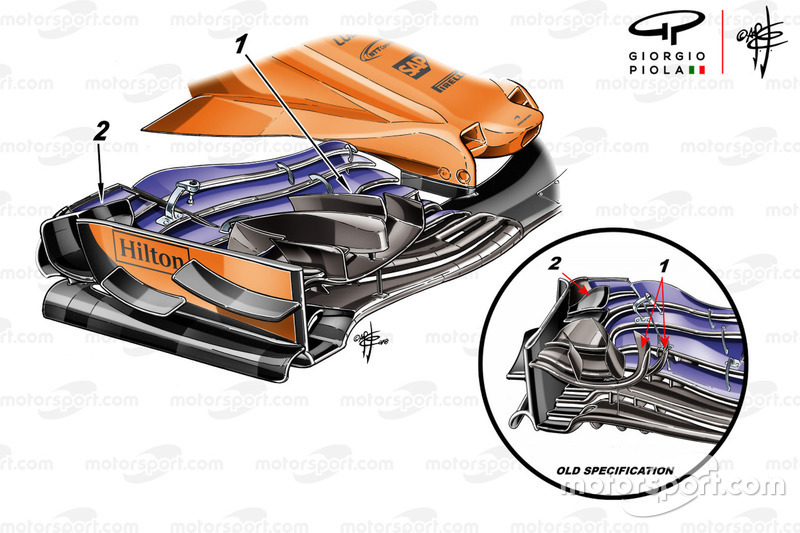 McLaren introduced a revised specification front wing for the Monaco GP, complete with new a squarer profile for the main cascade (1), whilst the designers merged the uppermost endplate canard with the rearmost section of endplate. 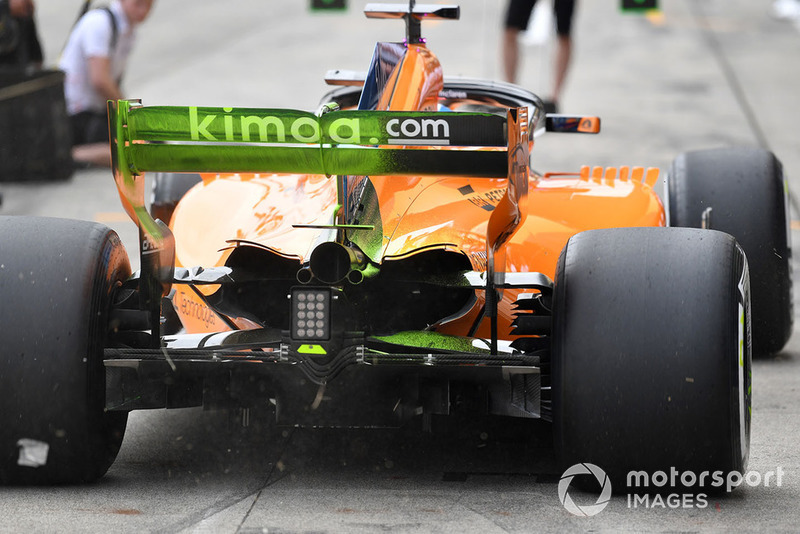 A test wing arrived at the Austrian GP and while unraced perhaps indicated some of the areas that the team believed they were struggling with. 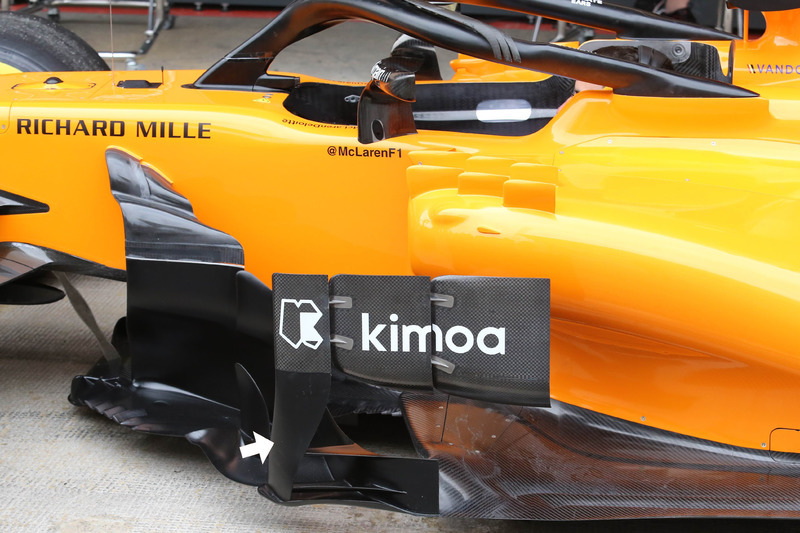 The test item had an enlarged arched footplate (blue arrow), a much shallower leading edge to the main plane, much like we’ll see due to the rule changes in 2019 (highlighted in yellow) and the lowermost of the flap-stack's elements was upturned (much like we’ve seen Red Bull do in the past) in order to change the vortex shed at the surface juncture below. 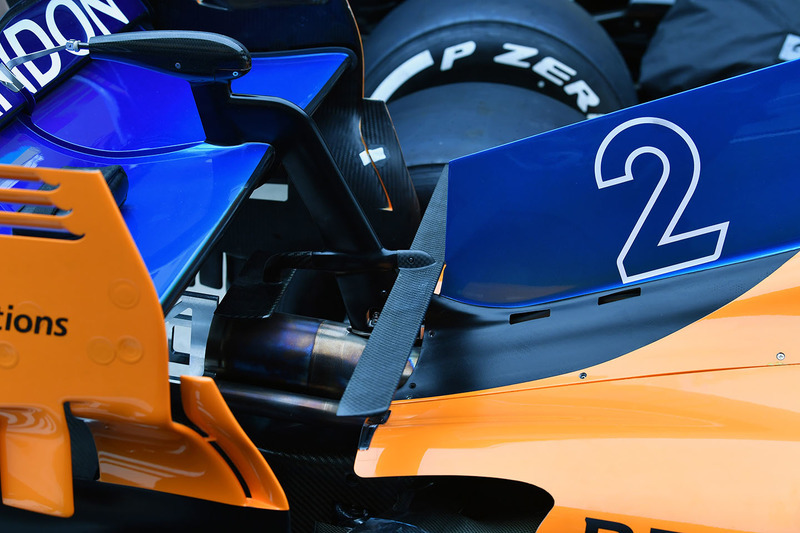 At the British GP the team chose to remove their triple-element winglet from atop the halo and get a baseline for performance without it, as they sprayed flo-viz paint across the surface. 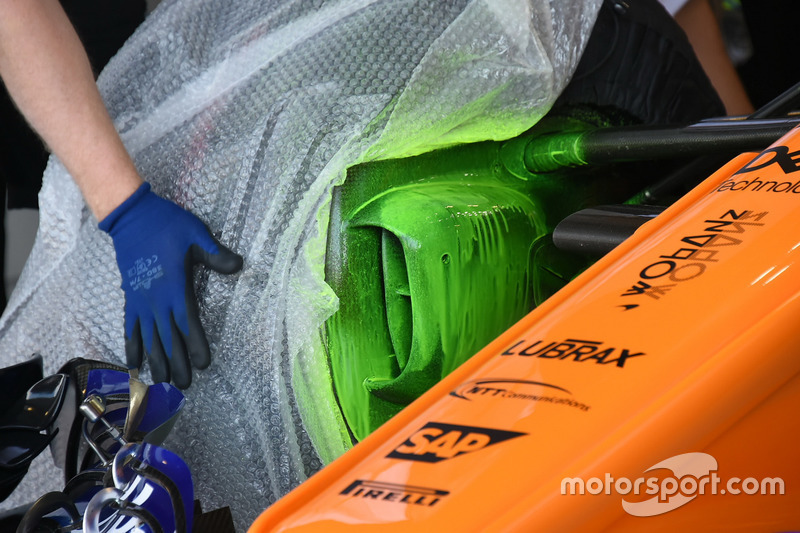 Meanwhile, the front brake duct received a similar level of treatment, as the team looked to establish how flow moved around the large inlet. 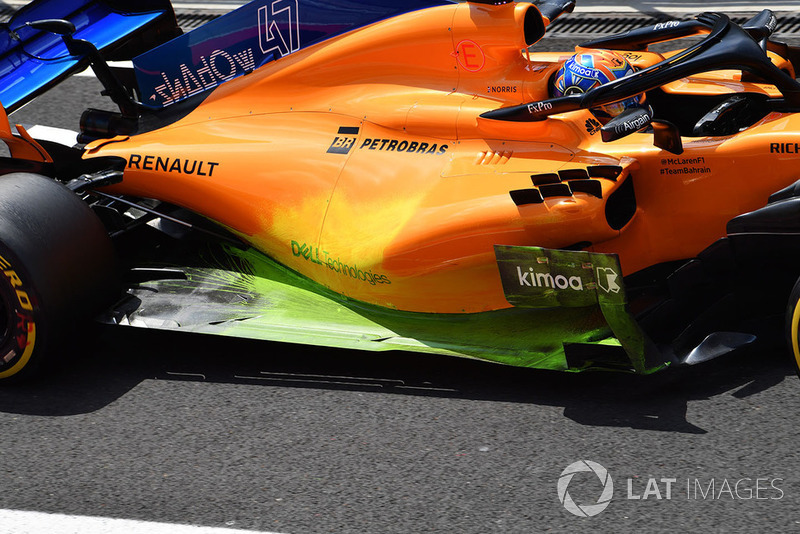 The team painted both the floor and the sidepod bodywork at the in-season test at Hungary as it tried to isolate areas of concern and get a clearer visual picture of these issues. The team did further investigation work at the Belgian GP, swapping out different floors for back-to-back comparisons. This floor and associated bargeboard paraphernalia was sprayed with flo-viz to give visual clues as to why they may not be working as anticipated. 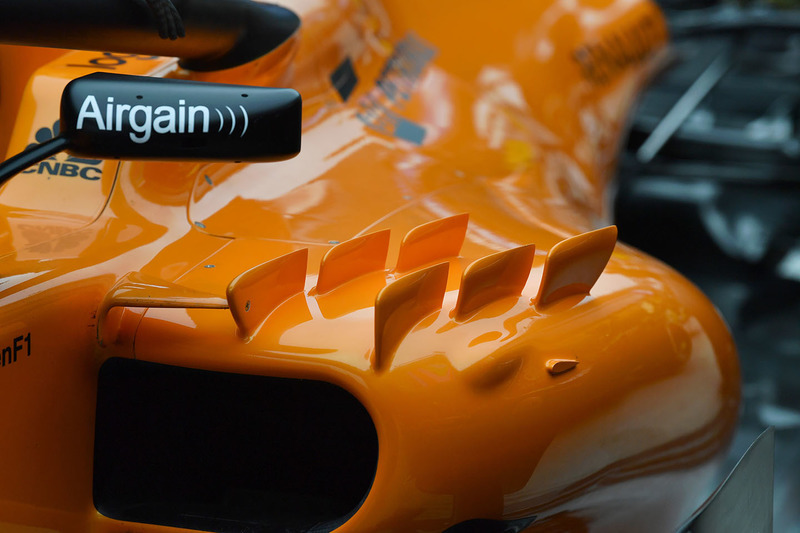 Giorgio was able to capture this close-up of McLaren’s sidepod deflector solution at the Russian GP. 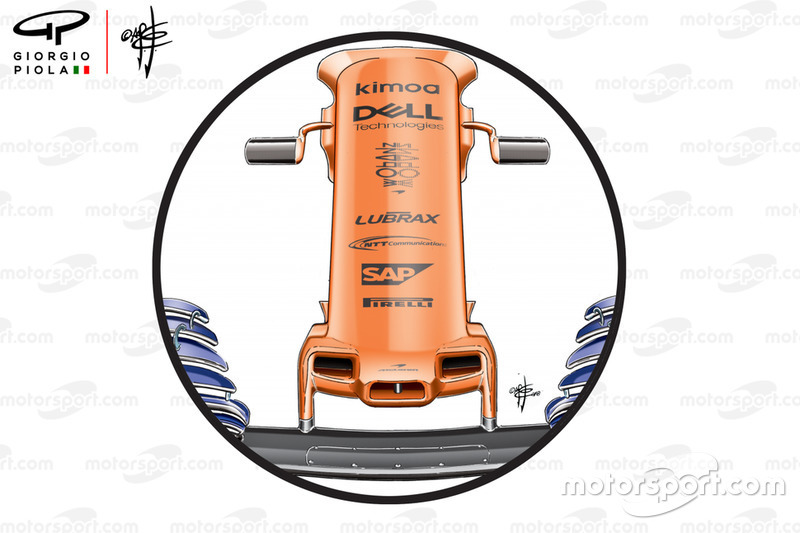 The three-element device looks to improve flow around the sidepods, while also deflecting the wake generated by the front tyre. 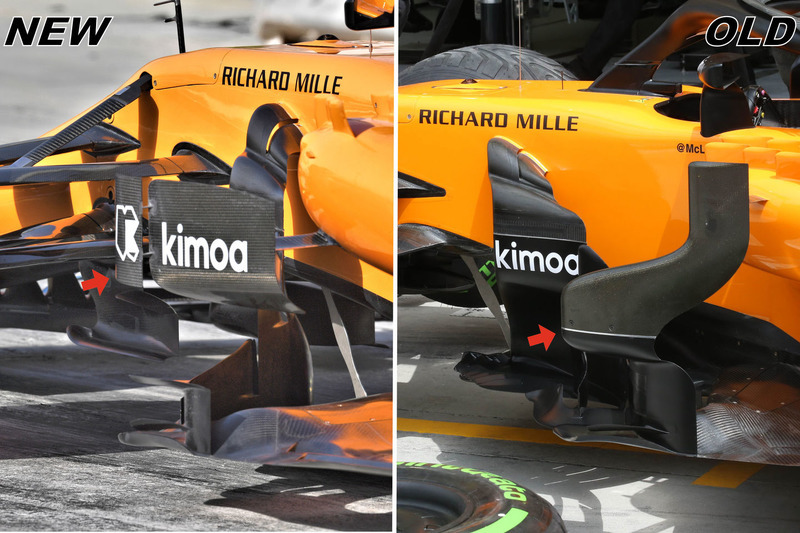 McLaren introduced a simplified rear wing endplate at the Russian GP, as the team made not only an effort to reduce some of the drag created by the car but also get themselves at a baseline for 2019, when the straked-style endplates will be outlawed. 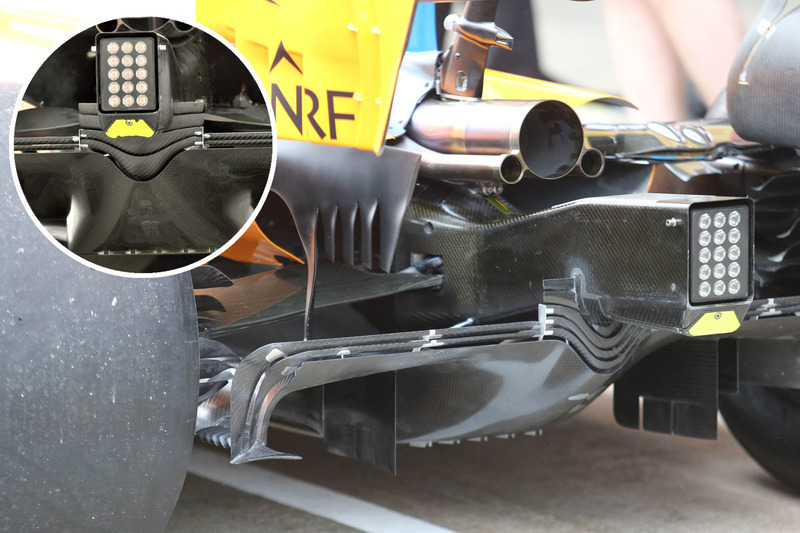 It mounted these additional sensors on the outboard section of the wing at the Russian GP – as analysis work for this year and as part of their preparatory work for 2019. 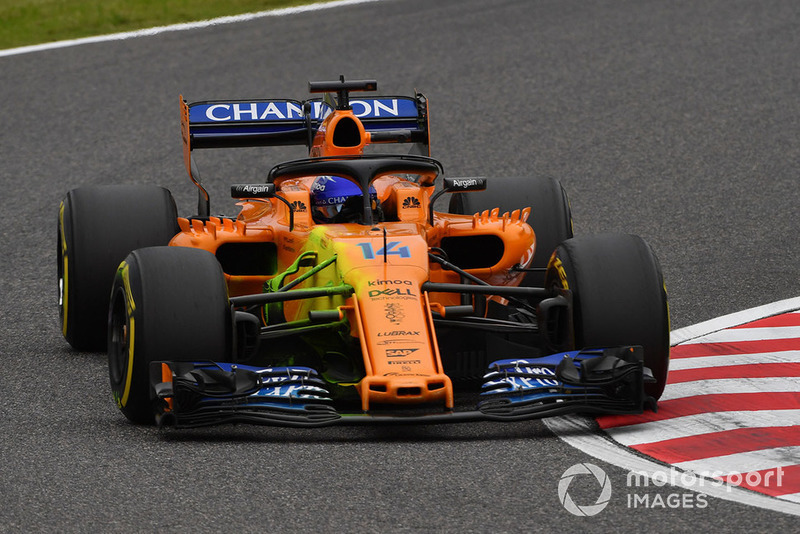 McLaren completed a number of aerodynamic tests at the Japanese GP, spraying areas of the car with flo-viz paint in order that the information can be fed back to the factory in the hopes it could be used by their designers to improve its simulation tools. Another of the flo-viz tests, this time at the rear of the car as the team looked to get a baseline from their strake-less endplates. 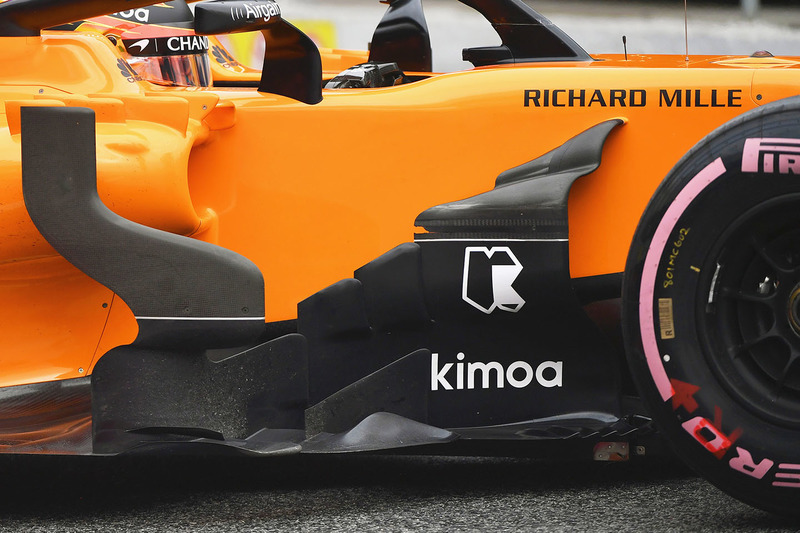 The aggressive nose solution was supposed to be the centrepiece in a conveyor belt of parts that would come through following its introduction at the Spanish GP. However, when performance targets weren’t met the updates that were supposed to follow were either shelved or drastically reduced in scale. 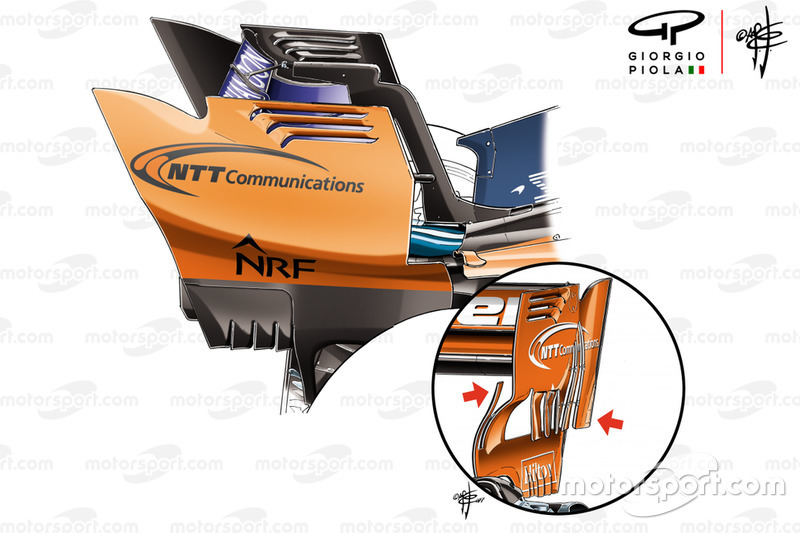 At the USGP the team arrived with a new iteration of the nose, devoid of the panels that flanked it, hoping this would improve flow consistency around the appendage. 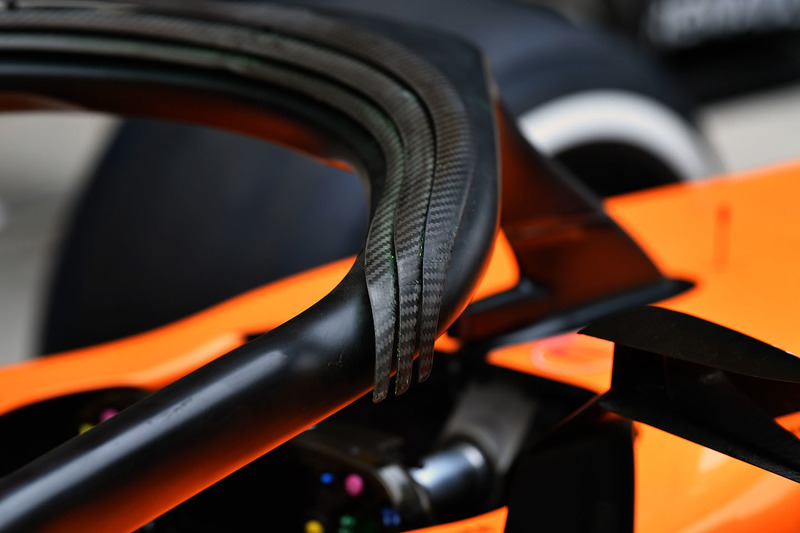 A side view of the MCL33’s sidepod region in Brazil shows us some of the development that the bargeboards have undergone in 2018, having started off relatively plain they became slot laden, while the footplate sported extra furniture on the leading edge.